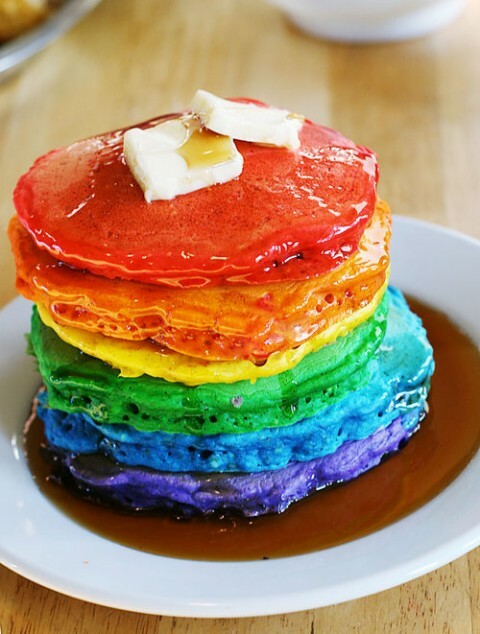 Tangled and True: rainbow pancakes. Stella wants a rainbow birthday. In my search for inspiration and ideas, I came across these pancakes. What little kid wouldn't love to start their day with a rainbow stack? I love these! I saw them a few weeks ago too and can't wait to try them...did you see on her blog where people were mad at her about them? Pretty silly. I bet Stella would love them - they remind me of Rainbow Bright! My hubby surprised me with this for breakfast on my birthday last weekend. I'm not a kid, but even I was totally thrilled!! Oh wow this is perfect! My Alla wants a rainbow birthday this year (#5! ), too! I feel hungry already. Rainbow pancakes for dinner. Oh yummy, I would totally want something like this for my birthday too...I'm still a kid at heart, right?! These are so cool. Will try making tomorrow! mmm great colours! I need to try this as well. Wow! All your birthdays are right together.